Take a flight of fancy and imagine if Alfred Hitchcock was plying his trade in Hollywood today. Back at his old Universal stomping ground, he’d probably knock off a Collateral or two, play himself on The Simpsons, exec produce episodes of Alfred Hitchcock Presents CSI Leytonstone (the place of his birth) and still find time for the odd curio designed to rub everyone up the wrong way –perhaps a shot for shot remake of Good Will Hunting. Yet the thing is you don’t have to imagine Hitchcock in modern movies, the seeds of his brilliance are scattered around the current crop of Hollywood helmers. The powers of audience manipulation of Spielberg. The controlled precision of Mann. The detached glee of the Coens. The twisted sexual subtext of Lynch. The shameless self-promotion of Tarantino. The waistline of Michael Moore. It is all present in Hitchcock. Every filmmaker working over the past thirty years has been touched by Hitchcock’s greatness, some lightly (The Wachowski’s Vertigo-inspired rooftop chase in The Matrix), others wholesale (Mel Brooks High Anxiety, Brian De Palma’s career). However many times he has been deigned a Vaunted Auteur –Tarantino once dubbed the study of his work “Film Buff 101” –Hitchcock’s influence, 25 years after his death is still without parallel. 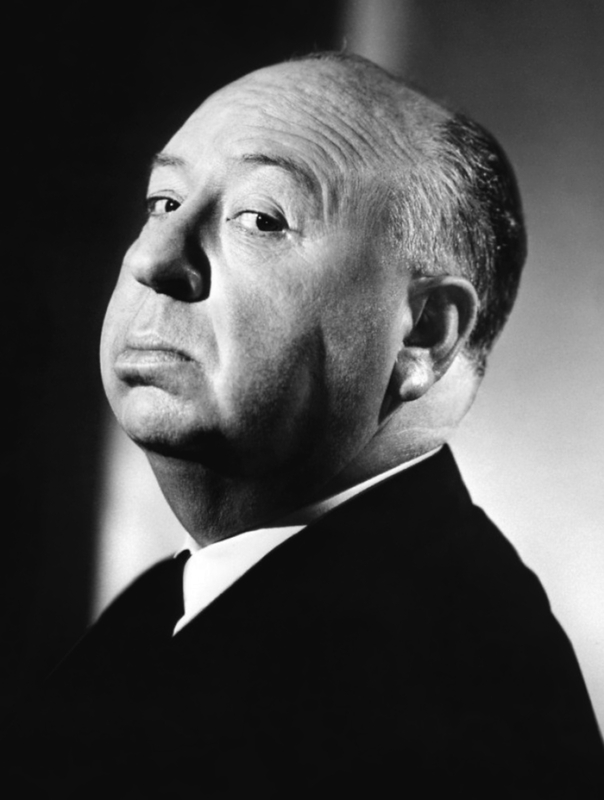 Hitchcock’s is a career spanning 54 years, traversing 65 films, two continents and practically every technical revolution (silents, sound, colour, even, as in Dial M For Murder, 3D). There were some bizarre experiments: remaking his own 1934 film, The Man Who Knew Too Much, some 22 years later, passing off ten long takes as one seamless shot (Rope) and creating a whole drama within the confines of a lifeboat (erm Lifeboat). There were some departures from house style; the romantic frippery of Mr And Mrs Smith, the courtroom drama of The Paradine Case and, in musical parody Elstree Calling, the bizarre spectacle of an Alfred Hitchcock directed custard pie fight. En route, there have also been some misfires; Stage Fright, Torn Curtain, Topaz. But even the clunkers bore great bits –witness the fistfight in Torn Curtain that demonstrates how hard it is to actually kill a man –and a Hitchcock film always sang with the possibilities of cinema. From his early UK work –Number 13 to Jamaica Inn –to the slicker stylish US output –Rebecca to Family Plot –cinema’s greatest heavyweight filmmaker (at his lardiest in the late ’30s, Hitchcock weighed in at 300lbs) delivered that rare thing: crowdpleasing bravura cinema that can be lapped up by the masses yet still complex enough to be pored over by speccy four-eyed academics. No filmmaker can count as many great fllms on a CV; (deep breath) The 39 Steps, The Lady Vanishes, Rebecca, Shadow Of A Doubt (reputedly Hitchcock’s own personal fave), Notorious, Strangers On A Train, Rear Window, Vertigo, North By Northwest, Psycho, The Birds. And these are just the can’t-argue-with masterpieces. In the process, he also invented the Filmmaker As Public Figure, cameoing in his own films (starting with The Lodger), extending his persona to books and TV and offering colourful, usually completely false, soundbite in interviews. Renowned for a mastery of must see- must-talk-about set-pieces –shower stabbings, crop duster dust-ups, avian attic attacks –Hitchcock’s real skill was making silly, often implausible stories engaging and compulsive. Poke around the narrative foundations of The 39 Steps or Vertigo or North By Northwest and you’ll discover that they are built on a bedrock of coincidence and absurdity. Yet the cinematic sleight of hand is so deft, the atmospheres are so intoxicating that you never once question it. What partly makes the films so rich is the dynamic between Hitchcock’s cold, calculated approach and the human passions (and perversions) of the characters trapped in his murky world. Late in life, Hitchcock admitted that two of his then current guilty pleasures were Burt Reynolds redneck-pleaser Smokey And The Bandit and Disney’s pooch parable Benji. Both share an uncomplicated lightness that rarely permeated his own work. While there is playfulness (especially in the Brit flicks and To Catch A Thief), Hitchcock’s movies boasts a pessimism rare in American cinema. Influenced by Russian horror merchant Val Lewton, Spanish surrealist Luis Bunuel and German Expressionist Fritz Lang –Hitchcock cited Lang’s Der Mude Tod (1922) as his favourite film –Hitchcock forged a consistent universe that sprung almost fully formed from his Catholic psyche, a world dominated by emotional dysfunction, voyeurism, sexual guilt, innocent men accused, icy blondes, overpowering mothers and psycho killers all played out against purposefully dodgy rear screen projections and often ending with a chase over a famous landmark. Marked by consistent collaborations with genius artisans –composer Bernard Herrmann, cinematographer Robert Burks, editor George Tomasini and graphic guru Saul Bass –it remains among the most coherent visions in movie history: take his name off the credits and you could still identify the director in a heartbeat. Hitchcock’s oft-misquoted pronouncement that actors are “like cattle” –he actually said actors should be treated like cattle –belies the fact that many of Hollywood’s finest did their best work under his direction. Cary Grant, Ingrid Bergman, Anthony Perkins, Sean Connery (in Marnie, Hitchcock makes manifest the darkness implied in James Bond) and, in particular, James Stewart found depths and tones that they never found anywhere else. Allied to his underrated skill with actors is the thrill of technical assurance, the sense that the camera and the cut are always exactly in the right place at the right time. The style is distant, elegant and succinct –when Hitchcock received the Irving Thalberg Award at the 1968 Oscars, he made the shortest acceptance speech of all time: “thank you” –assembled with a precision that makes Swiss clockmakers look slapdash by comparison. Yet in all the buttoned-down formalism, there are moments of wild expressionism –the Dali designed dream sequence in Spellbound, the flashes of red to indicate Marnie’s psychological scarring –that surprise and overwhelm you. Before he died in 1980, he’d joked that he wanted the motto “This Is What Happens To Little Boys When They Are Naughty” chiselled on his tombstone. It is a fitting epitaph for someone who spent a career revelling in life beyond niceness and convention. Yet perhaps what he ended up with is equally apt, an ode to complicity and his love of bad jokes: “I’m in on a plot”. And, thankfully, he let the rest of the world in too.